This is the main portal. At one time there were ore cart rails that led out to an elevated trestle and dump area. Depth: The center tunnel is reportedly 250 feet, however all tunnels combined are much deeper. Because of cave ins I could not accurately measure this mine. 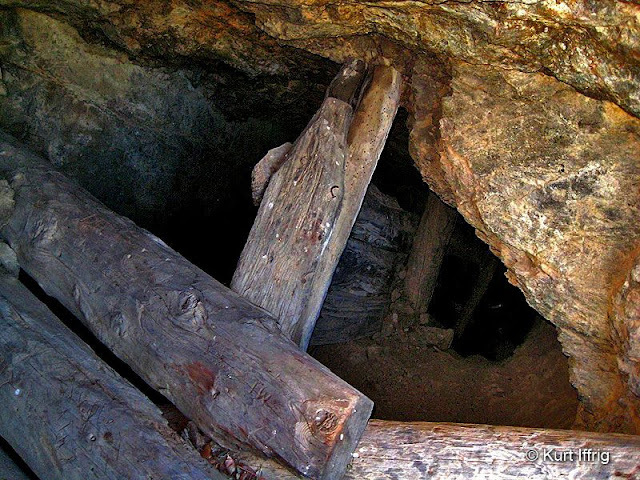 The logs at the portal partially cover a chute that leads down to a lower level. This mine has three levels. "George Allison and his three sons came into San Gabriel Canyon about 1917, after having previously mined in Mexico. 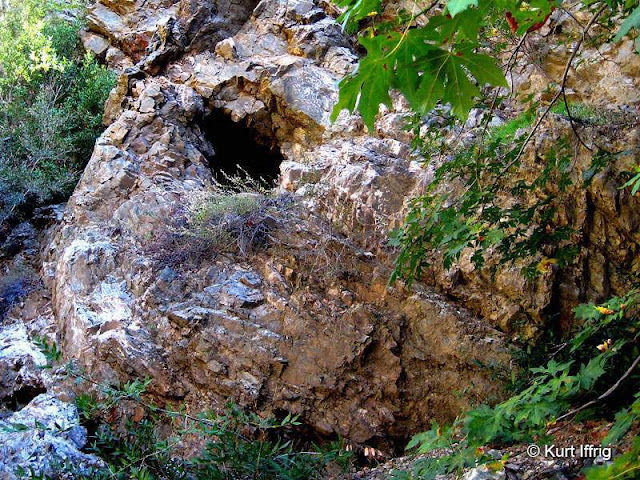 After working several prospects along the river for a short period, Allison discovered the promising quartz veins near the head of Laurel Gulch which became the Allison Mine. The mine was developed by several tunnels, the deepest penetrating 250 feet. The ore was first crushed with an arrastre; later a ball mill was erected. The Allison family continued to work their mine throughout the 1920's, achieving marginal success. About 1930 they sold out, and the succession of owners and claim jumpers worked the mine into the 1940's. Between 1934 and 1942, 10,000 tons or ore were recovered and milled at the Allison, yielding nearly $50,000 in gold. The mine has been idle since then"
There are two popular routes to reach the Allison Mine. Swan Rock is a key marker for the gulch route. Allison mine is remote, to say the least. I consider this one to be one of the "Trophy Mines". The late mine explorer Hugh Blanchard called it one of the "Mines We Will Never See". It is difficult to reach, but other mines in this area like the Stanley Miller, Widco / Baldora, Eagle and Gold Dollar mines are even more challenging. This blog is dedicated to expanding on the outstanding work and research of the late Hugh Blanchard and many other adventurers. Hugh was killed in a fall near Castaic Mine in 2008. 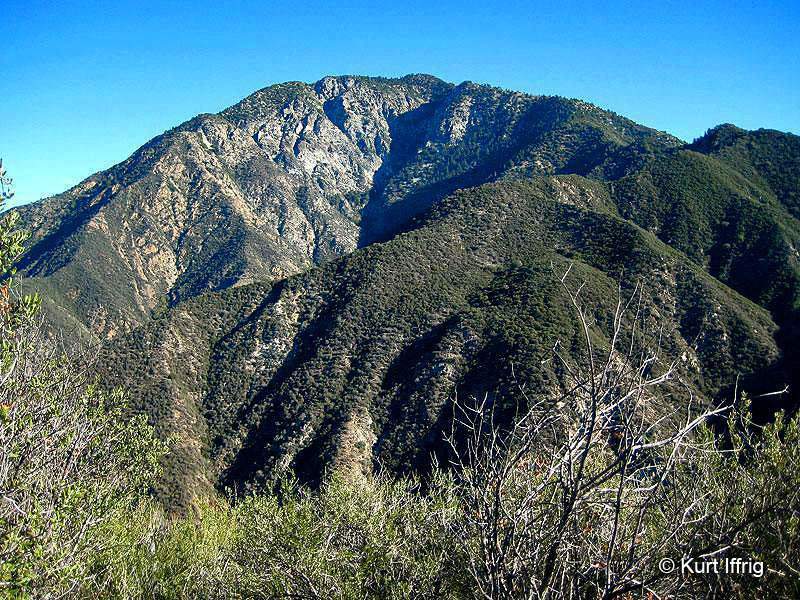 This is the first view of Iron Mountain along the ridge route. At this point there are still many hours left to go. To protect this mine from vandalism I will only give vague information on the routes. 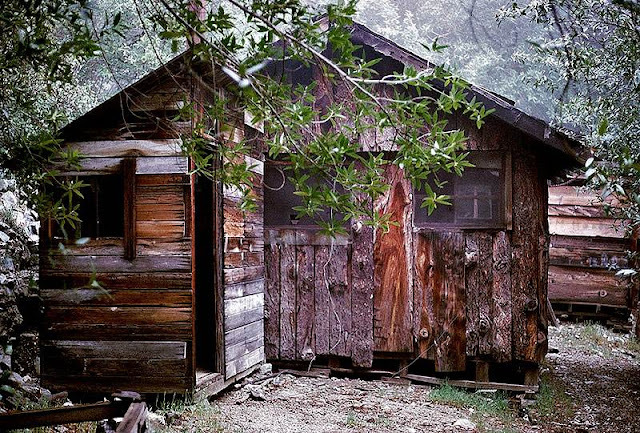 Two historic cabins and one work shed have already been destroyed at this site by the forest service. Their reasoning defies all logic, but I consider them even more despicable than taggers or looters. For precise information on routes to this mine you will have to visit other sites. Do your homework before attempting this venture. This is a collapsed ore hopper seen from a distance. I had nearly given up on this pursuit when I spotted it. 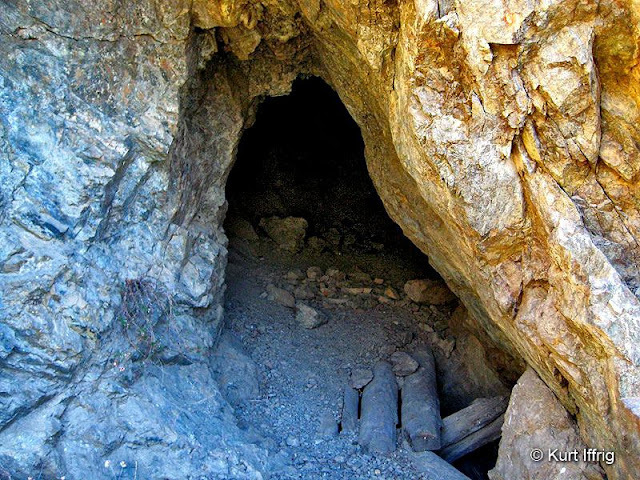 If you visit this mine, prepare yourself mentally and physically. It's an extremely long day trip and you can easily get lost if you don't do your homework. Bring plenty of water, more than you think you'll need. I ran out halfway through on a day in December that reached an unbelievable 91 degrees and was lucky to make it out alive. Also note that unless you're a fast hiker and spend practically no time exploring the mine, you'll probably spend the last hour or so walking in the dark. Your best bet in not to try this in the summer months. I call this the Indiana Jones Walk of Death. If you can successfully make it there's another room waiting. 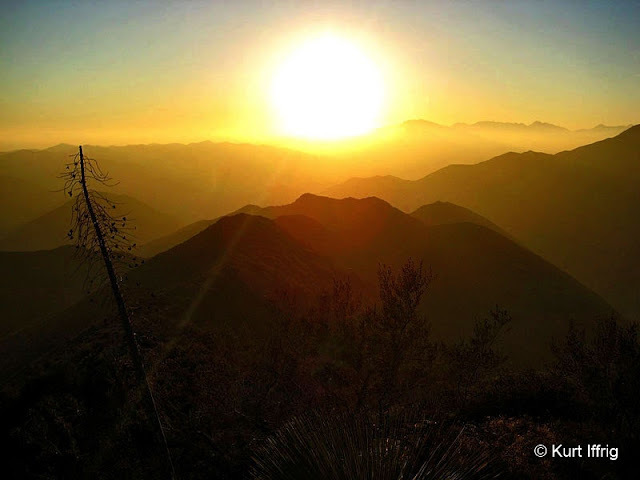 There are two popular routes to reach this mine; one via Allison Gulch and one via the Iron Mountain Ridge starting at Heaton Flats. I have also heard that it is possible to climb down from the summit of Iron Mountain, although this route is "extreme" and would presumably require rock climbing gear. So far I have only tried the ridge route. At one time there was a trail that connected the Allison Mine to the insanely hard to reach Stanley Miller Mine (which I have yet to visit). I don't know if it still exists, but if anyone has found it please let me know. 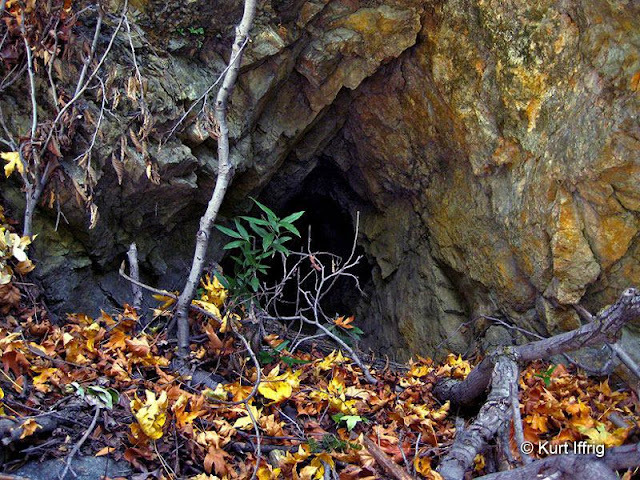 The Allison Mine's cavernous opening leads to several exploratory diggings in an outside amphitheater. 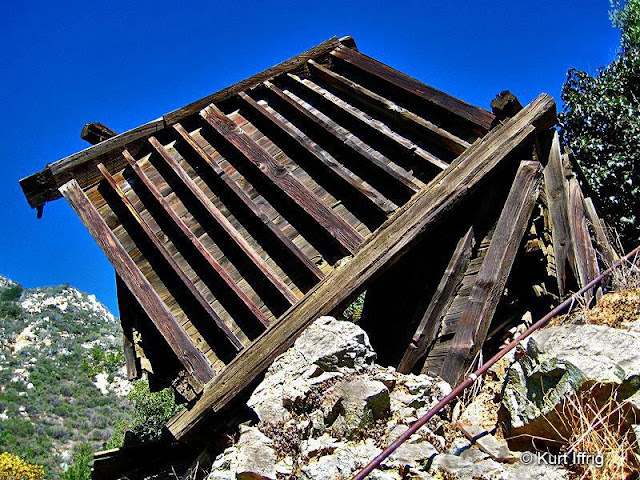 This mine rests in a deep scar on the southwestern side of Iron Mountain. It is not just one mine, rather a series of tunnels. Some connect and others do not. The main mine has three levels, although some areas are blocked by cave-ins. The main portal begins just north of the historical but fading Allison Mule Trail. 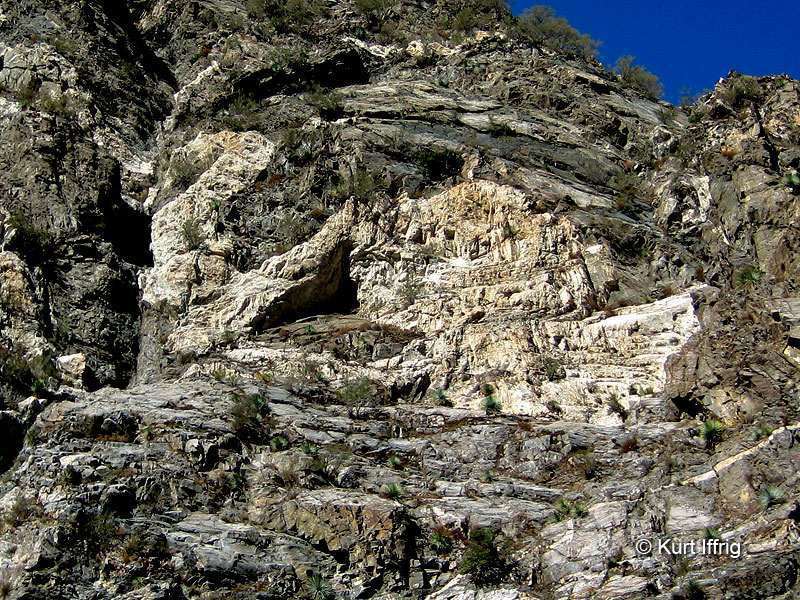 It has a cavernous opening, with several upward diagonal digs inside. There's also a pit with a log laying across it that leads into another room. Cross it if you dare. Further in there's a diagonal tunnel that leads up and outside, into what I would describe as an "amphitheater of mines". This upward tunnel is partially caved in, use extreme caution. This is one of several smaller exploratory mines in an area a refer to as the "amphitheater of mines". Once outside you'll see other mine openings. One to the left is completely collapsed. There are several others in the same area that do not go deep. If you walk down into the stream bed you'll find two more tunnels, one leads to an upper level of the main mine, the other leads to a lower level. Both have caved in areas. The bottom tunnel is probably the deepest of all, and winds around to a wooden chute just below the main entrance and beyond. Some areas were to dangerous to explore, so I will probably never know their true depth. Side opening from the Amphitheater of Mines area leading downward into the upper and center levels. This mining area has several relics which are still intact. An original cone-style ball mill rests a few hundred feet below the main entrance, as well as a large collapsed wooden ore hopper on the hillside above it. Unfortunately two cabins and one work shed are long gone, as well as an elevated ore rail that once emerged from the main adit and presumably led to a loading station. At one time there were random engine parts strewn around the ball mill, but most of them have been buried by decades of flooding and landslides. The collapsed ore hopper. Apparently there was once some sort of conveyor system that went up the hillside. 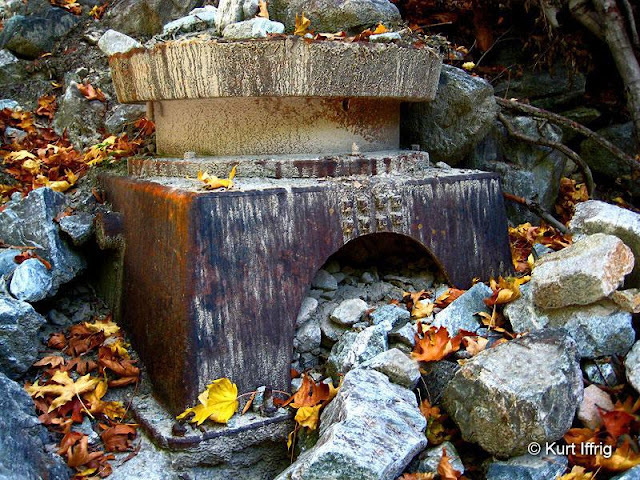 There are also a series of old water pipes that run down the hillside, possibly used for hydraulic mining and/or powering the ball mill. Inside the entrance to the main tunnel you will notice a downward shaft partially covered by logs. This is actually an old ore chute that leads to a lower tunnel that still has a wooden bin at the bottom with a detached catch gate can be found nearby. The lower tunnel can be accessed from the stream bed to the west side of the main mine. I also found a three foot long drill bit sticking out of a caved in area and even part of a box spring mattress in one of the lower tunnels. 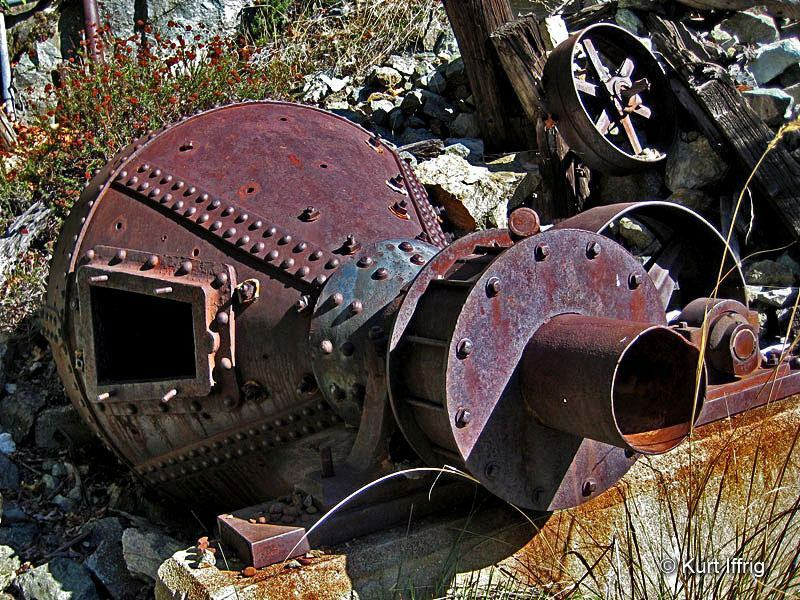 This is a seldom seen ball mill. Metal balls were placed inside while the unit rotated and crushed the ore. It's utterly amazing that the Allisons were able to bring in tons of heavy equipment with nothing more than mules and a crude mountain trail. The item in the photo below must weigh half a ton alone, and it's mounted on a cement block, which also had to be imported. The Allison Trail was once connected to and shared with the even more remote Stanley Miller Mine (located on the western side of Iron Mountain), which was presumably how they brought materials in. 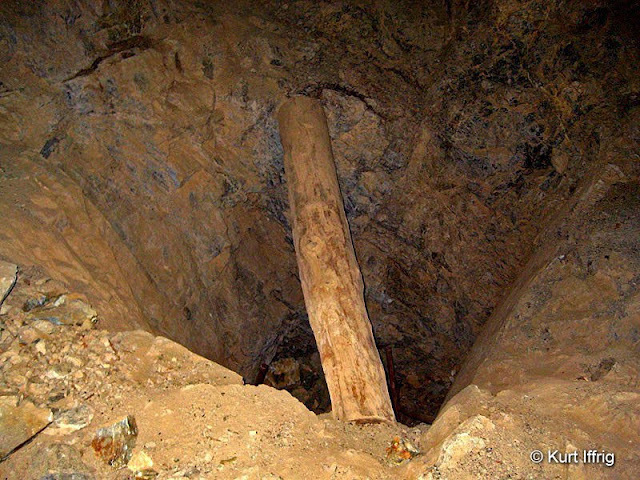 I have yet to visit this mine, but an old site map indicates they also used a ball mill. I found this near the mine's side tunnels. I'm not sure what it is, probably part of the hydraulic system. 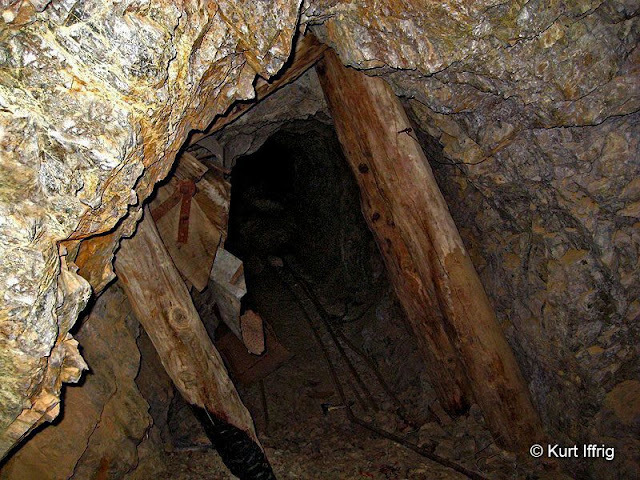 The Allison Mine was developed by experienced miners, and the tunnels were well thought out. The center level of the mine is accessed from the south side (above the Allison Trail), while the upper and lower tunnels can be reached from the stream bed to the west. It appears that at least some of the ore was dropped down via a chute from the center level and then was hauled out by rail. Before the ball mill was brought in, the Allison's used a primitive arrastre to crush their ore, which was likely located somewhere outside of the lower tunnel entrance. One of two side tunnels found in the stream bed. One leads to the upper level and the other to a lower one. The lower tunnel goes in straight and veers left, directly under the ore chute, below the logs at the center tunnel entrance. 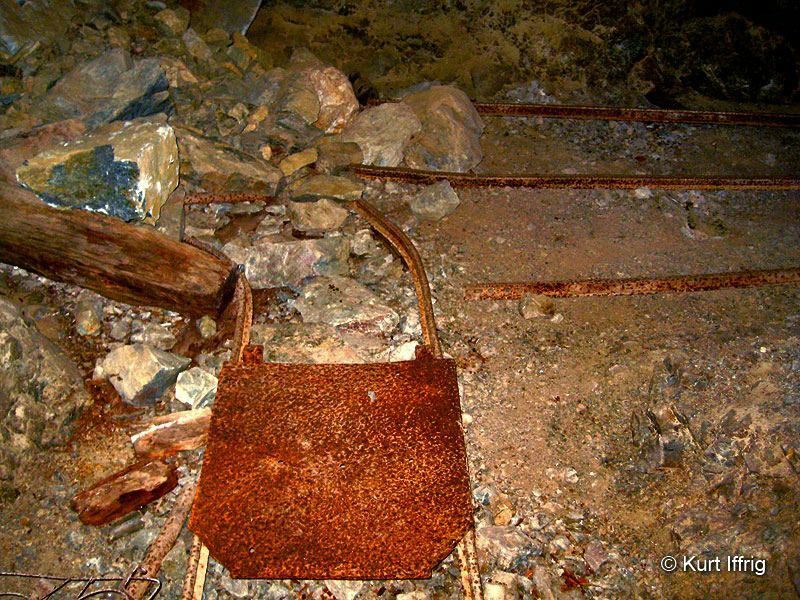 Some of the old ore cart rails and a metal catch gate that caught the ore are laying on the ground nearby. Some of these multi-level mines had bells above the ore chutes to warn miners below when rocks were coming down. Presumably at least some of the ore from the center level was hauled out through this side tunnel for processing. 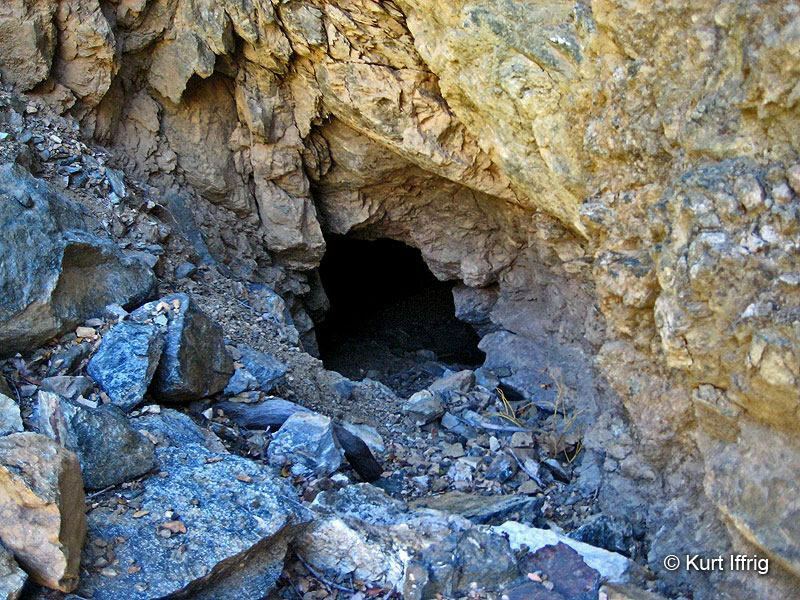 Beyond the ore chute is at least one partial cave it. Because of this I couldn't measure the tunnel accurately, but it goes quite deep. This is the bottom of a wooden ore chute in the lower tunnel. A detached metal catch gate was also found. There are several risky areas in both the top and bottom tunnels. Because of time constraints I wasn't able to fully explore this mine, but it is quite extensive. 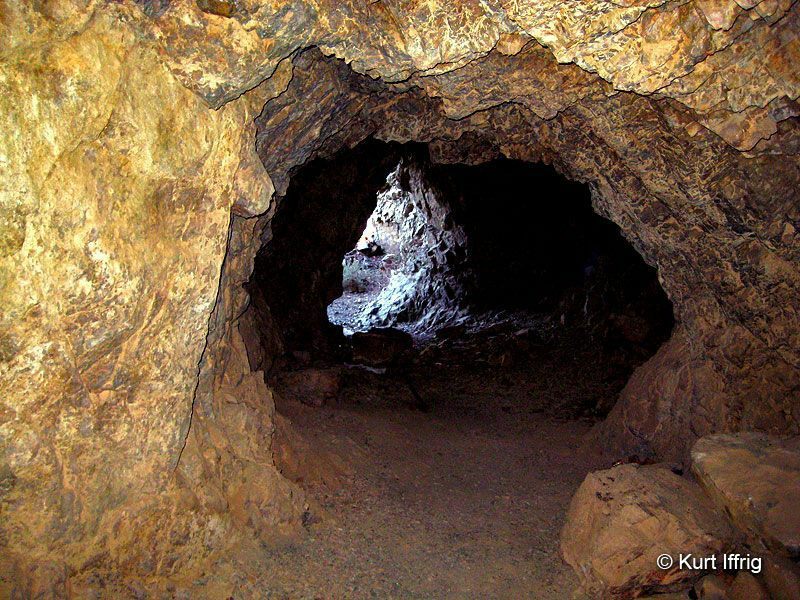 The top tunnel is almost completely blocked by a cave in, however it is possible to get beyond that point through yet another side entrance in an area I dubbed the “Amphitheater of Mines”. The most amazing thing about this mine is the thought of how the Allisons (and miners who came after them) were able to survive in such a remote location for so many years with virtually no food supply (other than hunting) and very little protection from the elements. If you would like to see more photos of the Allison mine and its surrounding area I have included a link at the bottom of this page. I rarely see multi-directional ore cart rails in these old mines. This one was unfortunately blocked by a cave in. The photo below is one of very few known shots of the Allison cabins, taken in 1973. Originally I had a photo of the same cabin taken in the same year by Charles Hayden, which came from an old slide, but the quality had deteriorated over the years. I was fortunate enough to come across a gentleman named Eugene Luder on a forum site that I frequent, who amazingly held on to photos from the same year. The quality of Eugene's photos were much better, no offense intended to Mr. Hayden, so now we have a beautiful record of something that has long since disappeared. At one time there were three structures standing near the Allison Mine, two rough cut cabins and a small workshop. Sadly they were all destroyed by the forest service sometime in the late 1970’s. The photo below was also taken in 1973 and has long since disappeared. It’s an old elevated trestle that led to an ore drop area above the ball mill. This photo was also taken by Eugene Luder. Piecing together Eugene's other photos, it appears that at one time there were upper and lower tram buildings that moved the ore down an impossibly steep mountainside. The Allisons were true mining professionals. If you would like to see more of Eugene Luder’s collection of Allison Mine photos from 1973, click here. 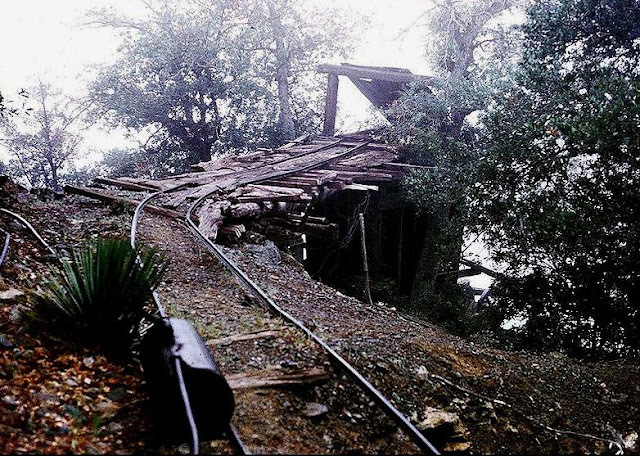 Below you will see what Allison Mine looked like in 1973, before the ever destructive forest service destroyed three historical structures at an ultra-remote location, for no apparent reason. Amazingly this Super 8 video with no sound remained intact for all these years and gives us a glance back at what we lost. Many thanks to Tom Mahood and Phil Budig for taking this video and putting it up on YouTube for all to see. Who would have thought that temperatures in December could rise to 91 degrees? And yet, they did. By the time I reached Allison Mine I had basically no water left, and the stream bed was bone dry. I thought about waiting until the sun fell to hike out, but knew I could never pick up the Allison Trail in the dark. 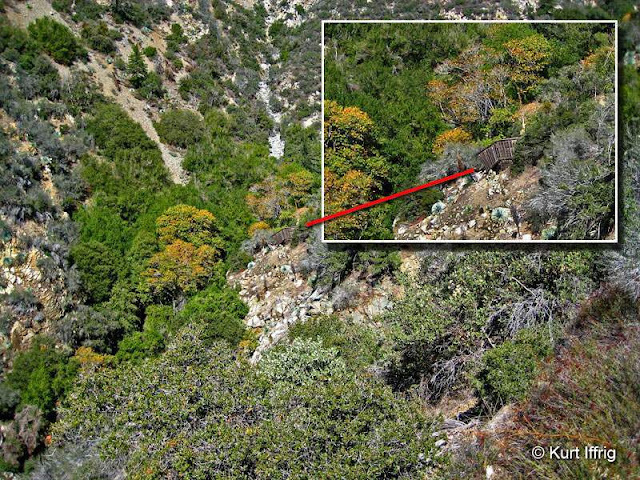 To make matters worse, most of this trail is unshaded and much of it is overgrown with whipple yucca (sword plants). At one point along the way I was in real trouble. My legs gave out and I had to lay down under a blazing hot bush for 30 minutes just to recover. Dehydration can do some devastating things to your body. I was never so happy to see the sun fall. At the moment I was in no mood to enjoy this beautiful sunset. After a long rest I trudged on. It was going to be a long trip out. The Allison Trail is over 100 years old, and accounts for the hardest 20% of the ridge route. If I could just get it to the Coldwater Saddle I knew I’d make it out. I’m not sure why they call it Coldwater Saddle, there’s no water there, and it’s sure as hell not cold. Along the way there was an annoying song stuck in my head that kept repeating over and over. But eventually the sun did go down, and the temperature fell to a mere 80 degrees. Thoughts of a frosty can of Fosters kept me going. When night fell the critters started coming out. 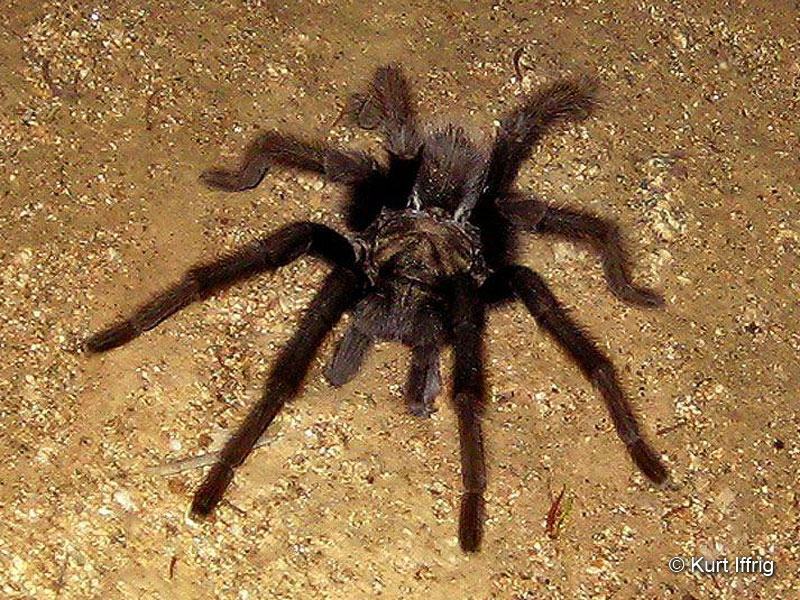 This tarantula was the only wildlife I saw along the way.